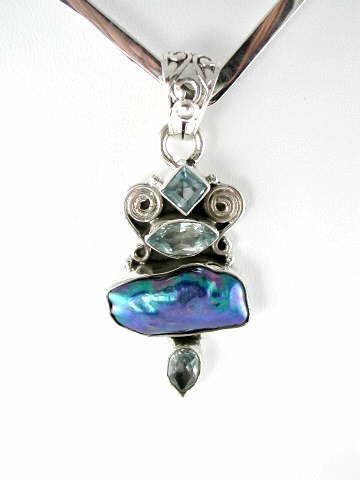 Unusual and exceptionally pretty, contemporary blue Biwa pearl and faceted blue Topaz pendant set in 925 sterling silver with a lovely filigree bail. The blue Biwa pearl is dyed. Topaz is typically found as a beautiful, golden brown to yellow stone (Imperial Topaz), with the latter often being mistaken for Citrine, and vice versa. Blue Topaz is found in nature, but is far rarer. Most of the Blue Topaz available commercially is usually heat treated clear Topaz. Nonetheless, it is still real Topaz and has the same metaphysical properties of the naturally occurring type.